"As a Blender for over 60 years, Douglas Laing has acquired a wide range of casks of Single Malt Scotch Whisky from all the regions of Scotland from 10 to over 40 years old. Since 1998 we make some of that stock available to be bottled as Single Malt, Single Cask Scotch Whisky. Our wide collection includes some of the most iconic Malts in the history of Scotch Whisky, like Macallan, Port Ellen or Rosebank, just to name a few. All our expressions are bottled Unchill Filtered and at Natural Colour to preserve the qualities our Malts have obtained during their life in the cask. Douglas Laing presented a selection of their wide collection of Single Malt Single Cask bottlings at the Grand Tasting of VWF." 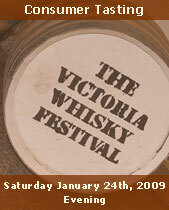 The Festival was very pleased to welcome Peter Currie of Springbank Distillery to the 2009 Victoria Whisky Festival. Dating back to 1828 Springbank Distillery is one of the iconic distilleries of the industry producing exceptional single malts in various forms. Springbank is produced using the most traditional of production techniques, from floor malting all the way through to the bottling stage, Springbank can best be described as a "hand-made" single malt. Springbank has a rich complex character with a subtle briny back bone and is quite delicious. Join Peter in tasting the various single malts offered by this wonderful distillery. The Grand Douglas Laing & Springbank Tastings were held concurrently on Friday evening. The 2009 Masterclass schedule not only offered increased capacity but we were also very pleased to offer increased diversity with whiskies from Canada, Scotland, Ireland, The United States of America and for the very first time, India. The additional capacity was represented by a new time slot from 11:15 to 12:15. Featuring whiskies from around the world, a selection of single malts and blends, independent bottlers and distillers presenting their own whiskies, the 2009 Victoria Whisky Festival offered a unique range of quality whiskies for the attendee. School was never like this! We were very excited to offer this new masterclass which is at the other end of the spectrum from the Introduction to Whisky Masterclass. Attendees were taught how to score and rate whiskies from one of the more experienced and disciplined enthusiasts in the world. Davin de Kergommeaux, who is also a founding member of the highly respected Malt Maniacs (one of only 2 in Canada and there are only 25 world wide), who live and breath whisky. Davin has scored nearly 2300 different whiskies from around the world and is also a judge in the Malt Maniacs Annual Awards where nearly 200 whiskies are rated and scored blind. 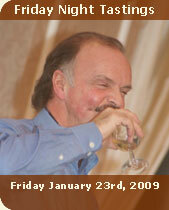 Davin is also judging the finals at the World Whisky Awards in London (2008). Attendees worked their way through 5 single malts and learned how to accurately score and rate each individual whisky. Happily they were able to taste your work! Richard Cmajdalka, Sommelier and Territory Manager for Charton Hobbs led an informal and entertaining class on the production of Scotch and American Whiskey. Geared toward the novice whisky drinker it also included a segment on whisky tasting. 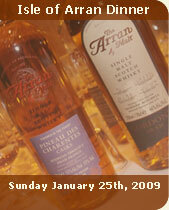 Featuring the Whiskies of Glenmorangie, Ardbeg, Glenrothes, Cutty Sark, Jack Daniels' and Woodford Reserve. Participants followed Maker's Mark from field to bottle during a one hour tasting session with Maker's Mark Distillery Diplomat, Ron Oliver. During this tasting they learned what goes into making bourbon and why Maker's Mark goes to great lengths to ensure that you get the very best in each glass. Participants tasted and discussed Maker's Mark from the time it comes off the still through different barrel ages; from 1 year to fully mature and finally an over-aged version. Along the way, they learned the history of not only Maker's Mark but some of the other colourful characters in the bourbon business, as well as the importance of the barrel, the water and the grains that go into making bourbon a true American original. Woodford Reserve is a premium small batch bourbon whiskey made in the Labrot & Graham's Old Oscar Pepper Distillery, near Versailles, Woodford County, Kentucky. Established way back in 1812, it is one of the oldest of nine working bourbon distilleries in Kentucky. This wonderful small batch bourbon is highly rated by Jim Murray and coveted by enthusiasts the world over. This masterclass was led by Chris Morris, Master Distiller Woodford Reserve. Woodford Reserve Masterclasses ONE and TWO were identical in format. Ashok Chokalingham led the lucky participants through the excellent whiskies of Amrut Distillery of Bangalore, India. Amrut single malt is made from Indian barley which is mashed and distilled in small batches and matured in oak barrels in a unique tropical environment at an altitude of 3,000 feet above sea level at. Jim Murray rates the Amrut single malts very highly; discover Amrut single malt for yourself! The Amrut Masterclasses ONE and TWO are identical in format. Once again our friends from the Scotch Malt Whisky Society returned to Victoria. This special masterclass featured a variety of the famed Society single cask malts with Alan Shayne, president of the SMWS of America. The SMWS bottles and resells to its member's single malt whiskies from single casks, at cask strength from active and silent distilleries. The Douglas Laing masterclass featured a stunning range Single Cask, Single Malt Whisky. Single cask bottlings are a rarity and Douglas Laing is one of the premier bottlers of such Whisky of superb quality, age and distinction. One of the Laing brothers led the Master Class and offered participants an insight in their Whisky Archive with a selection of some iconic Malts in the history of Scotch Whisky, all Unchill Filtered and at Natural Colour. Mr. Laing led this exciting class. Macallan: In late 2008 Craig Johnstone, Macallan's Western Canadian Brand Ambassador, made a pilgrimage to Jerez in the south of Spain. His mission was to build a cask. Participants joined him as he explained the trials and tribulations of this once in a lifetime trip, as well as everything they ever wanted to know about oak. Craig poured for the lucky attendees the following; a sampling one Oloroso Sherry Macallan, some new make spirit and a flight of Macallans. Woodford Reserve is a premium small batch bourbon whiskey made in the Labrot & Graham's Old Oscar Pepper Distillery, near Versailles, Woodford County, Kentucky. Established way back in 1812, it one of the oldest of nine working bourbon distilleries in Kentucky. This wonderful small batch bourbon is highly rated by Jim Murray and coveted by enthusiasts the world over. This masterclass was led by Chris Morris, Master Distiller Woodford Reserve. Ever since Catholic monks enjoyed some of the first recorded tastes of whisk(e)y in the 13th century, whisk(e)y has been embraced globally and become part of the history and heritage of many countries around the world. Whisk(e)y has also taken on the many unique characteristics of each country, just as the regions of Scotland offer unique flavour offerings to Scotch, whisky. Brand Ambassador for Diageos Reserve Brand's Kris Steed, toured participants through the very different but impeccable whiskies exploring the Celtic Cousins; whiskies from Ireland, the United States and Canada plus look at what makes these whiskies unique and different. The lucky attendees of the Jameson Irish Whisky Masterclass were both educated and entertained by John Molloy, Jameson Irish Whiskey Ambassador, who talked about the origins, history and the unique use of triple distillation to produce Jameson Irish Whiskey. Additionally John talked about the history and origins of whiskey including the Jamseon Distillery that dates back to 1780. The complete line of Jameson whiskies were poured in this masterclass. Once again our friends at Murray McDavid returned to the Festival with a new line of products from unusual distilleries from around Scotland. Murray McDavid carefully selects casks from these distilleries and then bottles them without the addition of chill filtration or any coloring preserving the natural flavour. This masterclass was led by Andrew Gray of Murray McDavid and focused on the contribution of the Superior Casks selected by the company. Jonathan Bray and Frances Dupuy of A. Dewar Rattray Independent Bottlers led attendees through the company's excellent line of single cask bottlings. The Dewar Rattray line featured a variety of ages from active and silent distilleries, examining single cask bottlings first hand. Highland Park: "The Best Spirit in the World." Participants joined Highland Park's Canadian Brand Ambassador Craig Johnstone and explored the maturity and generosity in a dram of the most respected spirit on the world. "The Award Winning Whiskeys from Irelands only Independent whiskey distillery" with John Cashman, Brand Ambassador, Cooley Distillery. Participants joined John Cashman from Cooley Distillery, Ireland's only Independent whiskey distillery, as he took participants on a journey through the Award Winning range of whiskeys from Cooley Distillery. Participants learned more about the historic brands and ancient distilling techniques revived by Cooley from Irelands rich whiskey making heritage. John poured a selection of whiskey's from the Cooley Portfolio including the Award winning Kilbeggan Irish whiskey, Tyrconnell Single Malt, Connemara Peated Single Malt and Greenore Single Grain range of Irish whiskeys. From a small grocery store in the town of Kilmarnock, Scotland came a 15 year old boy with a gift of blending tea. John Walker's passion spread to blending whiskies for the townsfolk of Kilmarnock and he soon became known for his expert whisky blending skills in all of West Scotland. Since then, the Johnnie Walker name is celebrated globally for quality and consistency while the iconic square bottle with the slanted label is seen on shelves everywhere. Participants joined a 36 year veteran of distilling, Michael Nicolson as he took them through the Johnnie Walker Labels, including Red, Black, Green, Gold and Blue as he explains the nuisances that make each Johnnie Walker label so unique and special. So you think you can tell the difference between an Islay and a Speysider and a Canadian or an Irish Whisky? Well this was your chance to prove it and if you were correct you had bragging rights by the hogshead. The lucky participants nosed and tasted their way through a selection of whisky samples and attempted to and guess the correct distillery for each sample. There was a prize for the winner(s)! and for those that were not quite so accurate, they consoled themselves with some very fine drams. "Bruichladdich Distillery Company Innovation" Andrew Gray of Bruichladdich Distillery led attendees through the innovative single malts from this famed and maverick Islay distillery. The distillery is increasingly well known for its very small bottlings runs featuring varied and unusual expressions which are much sought after by collectors. Not to be missed!! James Robertson of Tullibardine Distillery in Blackford, Perthshire, Scotland led attendees through the single malts of this independent distillery. James focused on the very successful wood finish program including single malts matured in Sauternes, Moscatel, Sherry and Port casks. Attendees will be able to examine how wood finishes compliment the elegant, soft and fruity style of Tullibardine and James has promised some unusual and very new cask samples! Ashok Chokalingham will lead the lucky participants through the excellent whiskies of Amrut Distillery of Bangalore, India. Amrut single malt is made from Indian barley which is mashed and distilled in small batches and matured in oak barrels in a unique tropical environment at an altitude of 3,000 feet above sea level at. Jim Murray rates the Amrut single malts very highly; discover Amrut single malt for yourself! From Scotland's Distillery of the Year 2007, Euan Mitchell presented several crackerjack, award winning whiskies from this Island distillery that was only established in 1991 and commenced distilling in 1995. Isle of Arran Distillery has gone from strength to strength consistently rolling out some grand very well made single malts. As always the Arran masterclass was not one to miss. Lodged far from any neighbor in the small coastal community of Carbost at the head of Loch Harport, is one of the finest yet most remote distilleries of all. As the lone distillery from the western Scottish island of Skye, Talisker's® soft, peaty process water is drawn from twenty-one underground springs that rise from Hawk Hill (Cnoc nan Speirag) beside the distillery. These same springs have fed Talisker from the beginning. As its name suggests, the hill is home to birds of prey, usually including Peregrines. Join us as we explore the whiskies of Talisker with your guide, Michael Nicolson, a 36 year veteran of the art of distilling, and journey through Talisker's malts. Inver House Distillers was delighted to be once again holding a Masterclass at the 2009 Victoria Whisky Festival. With 5 highly regarded distilleries, including An Cnoc, Balblair and Old Pulteney and the award winning Catto's Blended Scotch Whisky a selection of their award-winning single malts were featured. As in previous years, participants were informed and entertained! 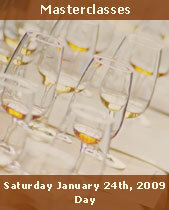 The VIP Tasting was open to special guests of the 2009 Victoria Whisky Festival and VIP Ticket holders. It was held in the Vancouver & Pender Island Ballrooms prior to the Consumer Tasting and featured the full line of whiskies as with the Consumer Tasting. VIP Ticket holders were able to explore the range of whiskies being presented for a full hour prior to the Consumer Tasting (Ticket price includes VIP Tasting & Consumer Tasting). The heart of the Festival is the Consumer Tasting held in the Hotel Grand Pacific's Pender Island and Vancouver Island Ballrooms featuring a myriad of distilleries and whiskies including Canadian whisky, Scottish single malts and blended whiskies, Irish whiskey and a variety of whisky & whiskey styles from the United States of America. The Hotel Grand Pacific will be providing the best Hors d'Oeuvres from their award winning kitchen and Chefs using local ingredients including the very popular & elusive haggis tarts created especially for the Victoria Whisky Festival! Here you will be able to satisfy your whisky curiosity by sampling your choice of over 100 whiskies, the largest selection available for such an event in British Columbia. The Hotel Grand Pacific's Executive Chef Rick Choy paired exceptional local ingredients with the single malts from the Island of Arran Distillery located on the west coast of Scotland. This exceptional evening, in the highly acclaimed The Mark restaurant, featured single malts from this relatively new distillery that is taking the single malt whisky world by storm. Mr. Euan Mitchell of the Isle of Arran Distillery led the evening.